The Hideaway Cottage is located on the Santa Fe River, surrounded by hundreds of natural fresh water springs, off of SR 138 between Fort White and Branford, Florida on a beautiful wooded 6 acre lot with a winding boardwalk to the dock on the Santa Fe River. Enjoy sitting around the fire-pit in the evenings, on the cottage’s deck, or the floating dock, while watching wildlife; including deer, turkeys, hawks, rabbits, raccoons, otters, manatees, beaver, and other wildlife feed near the cottage. Upriver just minutes from the cottage; is the mouth of the beautiful, crystal clear, Ichetucknee River and the Hwy 47 public boat ramp. Down-river just minutes are three very popular boat camps/boat ramps on the Santa Fe River; SR 129 Bridge public boat ramp, Sandy Point Private boat ramp, and Ella Ray's private boat ramp, where many amateur and professional anglers put in the river then head just a few miles downstream to the Suwannee. If you are a Gator Fan and interested in attending UF Gators games the cottage is approximately 45 minutes away from the stadium, enjoy a special retreat at the Hideaway Cottage on the Gator football weekends. Autumn is a perfect time of year to enjoy the Springs and the Rivers. The cottage is 12 miles from the well know diving capital of Branford, Florida on the beautiful Suwannee River. Alachua, Columbia, Gilchrist, and Suwannee counties boast of all the beautiful clear blue-green springs that emerge from the limestone karst throughout the area. Free diving, cave diving, and snorkling in our springs are a popular year round activity. Several beautiful Florida State Parks are just a short drive of the Hideaway Cottage; Ichetucknee Springs State Park/North and South entrances, O'Leno State Park, & River Rise State Park. Many local county parks feature natural springs in the area. Also there numberous biking trails in the area, paved and natural located within miles of us for the cyclists. The historic towns of Fort White, (13 miles) and High Springs, (19 miles) are on HWY 27 to the east of the cottage. The Ichetucknee Springs State Park is just a few minutes north of us. Kayakers, paddle boarders, canoeist, tubers, snorkelers and divers enjoy this section of the Santa Fe where small boats and fishermen abound. Many private natural game hunting camps populate the area for the avid hunter. The cottage sleeps 4 comfortably, in the studio space, with one Queen bed, a full size, fold out Clack Clak sofa and a fold away cot. Cooking is easy in a fully equipped kitchen containing a coffeepot, microwave, electric stove, oven, and refrigerator in an open dining area with a table and 4 chairs. A ROKU TV, DVD player and WIFI are available. Enjoy the wide front deck area morning and night nestled into the edges of the natural woods teaming with humming birds, butterflies, owls, deer and wild turkeys. Be sure to check out the excellent restaurants and live entertainment that are near the cottage and also located in Lake City, Branford, High Springs, Trenton, and Bell, all of these towns are within a short diving distance of the cottage. Mike and Laura are retired from Columbia County School District, Mike, (2016) was a business administrator and Laura, (2012) was K-12, National Board Certified Fine Arts Educator and Adjunt instructor for the local college in Lake City. They love spending our time on all three of the rivers in the area. They have covered many water miles in their kayaks; Mike fishes, catch and release, Laura takes photos of the rivers, limerock bluffs, animals, flora and fauna. Laura is 5th genration Floridian from Tampa, Hillsborough County. Mike is 3rd generation Floridian from Lake City, Columbia County. Laura and Mike have great knowledge of the area and all the nearby places you'll want to see. We purchased this property after looking for a river place for 4+ years to spend our retirement. We split our time between Lake City and our river place due to our community volunteer projects with: the Lake City Columbia County Tennis Association The Orchard Community Church and the Olustee Festival-Blue/Gray Army. We love spending time on the river, swimming, kayaking, fishing, and boating. We fell in love the quiet of the natural, wooded, and secluded area. We enjoy watching wildlife, birds, turkey, hawks, and deer. It has been a dream come true to buy a place on the Santa Fe River, the home to many of Florida's most beautiful springs. You will enjoy the peace, and quite of the river, as well as the beauty of nature with amazing wildlife. Located in a rural farming community in Gilchrist County, home of three amazing rivers and 70+ gorgeous springs. The lot is 6 acres, with 300 feet on the Santa Fe surrounded by wooded privacy. Enjoy evening walks down the boardwalk to the floating dock, set out the chairs, share a refreshing snack or drink. We thank our Good Lord for the opportunity to enjoy and share this serene cottage with other river lovers. Walk-in shower, a stackable washer/dryer is in the expanded bathroom area. We are located near three historic towns; Branford/Diving capital of North Florida, High Springs,home of Ginny Springs and Fort White, home of the Ichnetucknee River. We are located in Gilchrist County in the heart of three beautiful rivers; the Ichnetucknee, Santa Fe, & Suwannee for amazing fishing, great game hunting, cattle ranches, native Florida hardwoods. 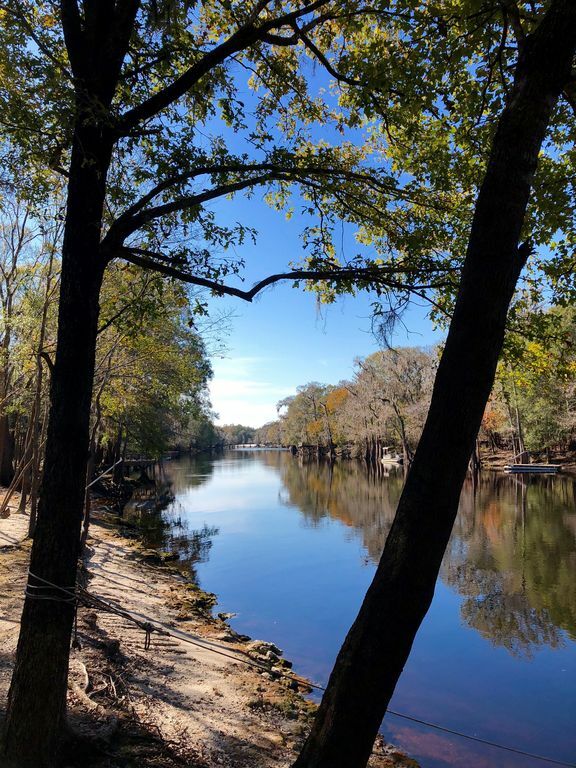 Our property is located on the Santa Fe River just minutes from the Ichetucknee River to the East (upriver) and minutes to the Suwannee River to the West (downriver). Blender, glasses, mugs, plates and silverware, a full assortment of eating and cooking utensils to create any dish you desire. Dining area seats four people comfortably. Variety of books, magazines, maps and brochures about the local springs, state parks, county parks and events in the area. 2 Public Boat Ramps: HWY129 Bridge & HWY 47 Bridge, 2 private boat ramps; Ellie Rays/Strozier's Landing, Sandy Point Motel and Campground. Large outdoor front deck with patio furniture for four. Lower ground level deck for grilling.Please keep grill away from siding on the cottage. A metal wagon for use as needed, for firewood. Two tennis courts are available nearby in the town of Fort White, (about 10 miles) at the Fort White Community Center. The owners Mike and Laura met us at the cabin when we said we would arive. They gave us a tour of the property taking us to the boardwalk down by the river and then brought us up to the cabin. They walked us through everything in the cabin and made sure we had everything we needed. We brought our kayaks along as we planned on floating down the Itchentuckney river so Mike offered to drive us to where we can go in so that we didn't need to take our vehicle and they even loaned us life vests as we had forgotten ours. They made sure they had markers out at their dock so thst we could kayak all the way down to their property. When we got back to their property Mike came down to the river with the golf cart to give us a ride back up to the cabin. The cabin itself is very comfortable, clean, nicely decorated and very well stocked we had everything we could possibly need. It was very obvious that Laura had put a lot of her heart and soul into every detail of that cabin. Our time there was short but was a very much needed relaxing time away. Thanks Mike and Laura for everything. So glad that you had a wonderful and relaxing time at the cottage. We enjoyed meeting you two and sharing time with you. We looking forward to you returning soon. We appreciate you! The property was exactly what we wanted, needed, and more than we expected! We loved our weekend getaway! The serenity and silence of the property was amazing, the cottage was absolutely perfect for us. Mike and Laura are wonderfully kind and generous people and we truly enjoyed meeting them and enjoying their piece of old Florida heaven. It was a pleasure to host the two of you. We look forward to a return visit in the future. We have been blessed in life and hope to continue blessing others. Hope to see you again soon. Absolutely a wonderful place for rest and relaxation. The grounds and accommodations were an absolute relaxing get away. Everything as described and seen in the pictures was just a tip of what was actually experienced. The Hosts were extremely friendly and made the cottage to be stress free. Easy access to the water and dock for kayaking and fishing. The sounds of nature all around. We loved the place. Thank you so much! We appreciate wonderful guests like you. We are glad you love the area as much as we do. It was nice how Mr Owl 🦉� came out to greet us. Come again soon. This cottage was the best home we've ever stayed in on vacation. Mike and Laura are gracious hosts. You will love the location and the spotless accommodations. The cottage, what I fondly call the tree house is equipped with everything you will need for a wonderful stay. We usually don't return to the same location for our vacations but will probably return is was so enjoyable. Thank you Mike and Laura for opening your lovely cottage. Thank you so much for your kind words. We would love to have you back again anytime. We hope to see you again in the new year! Thanks for taking such good care of the Hideaway Cottage. Simply lovely! The host's, the accommodations, the grounds all beautiful! Thank you so much! We are so glad that your stay was, serene and beautiful. Please come again and share with your friends. The property is located in the Suwannee River Valley region where hundreds of fresh water springs abound and three very beautiful and distinct rivers come together, Ichetucknee, Santa Fe, and the Suwannee. The Hideaway Cottage is close to several historic towns: White Springs, Lake City, Ft White, High Springs, Trenton, Bell, Branford, Live Oak (great resturants in each town).